Peeping Tom (1960, UK) is a Horror film directed by Michael Powell. Stark Terror Meets Art in a Deadly Game of Cat and Mouse. (DVD) | "Do you know what the most FRIGHTENING thing in the world is ...?" | Terror Meets Art in a Deadly Game of Cat and Mouse | WARNING! Don't see Peeping Tom unless you are prepared to see the screaming shock and raw terror in the faces of those marked for death! | Can you see yourself in this picture? Can you imagine yourself facing the terror of a diabolical killer? Can you guess how you'd look? 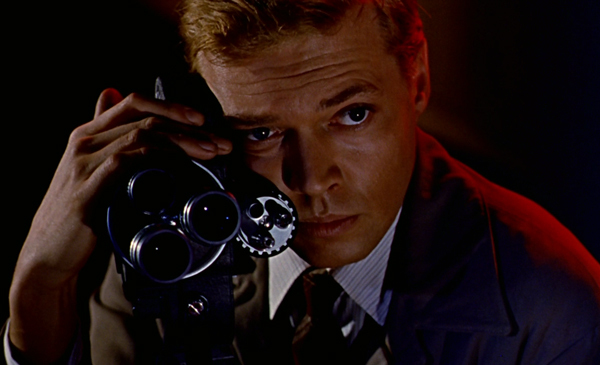 You'll live that kind of excitement, suspense, horror, when you watch "Peeping Tom". | Don't dare tell the ending to anyone - you'll be blamed for nightmares! | What made this the most diabolical murder weapon ever used? | An adventure into terror | More Horrible Than Horror! More Terrible Than Terror! | Marked for death by Peeping Tom - To Look Meant Danger To Smile Meant Death! This page was last modified on 31 January 2016, at 16:40.